This is part 3 of my short, 4-part series on Michigan brews. You can take a look at the first part, in which I discussed Atwater's Purple Gang Pilsner, to get a better idea of what this series is. To briefly describe it, I built a four-pack and threw in some beers native to MI that I'd never before had so I could share my first impressions of them with you, my beloved readers. Short's is one of the most recent breweries to cross my radar. The very first time I encountered it was when I was in Michigan in January and my cousin insisted that my dad and I try their Bellaire Brown, which, he claims, is the best brown ale in the world. Do I agree with him? That's neither here nor there because I'm not talking about Short's Bellaire Brown today (I may in the future, though). No, today I'm discussing the brewing company's Vintage Premium Lager. 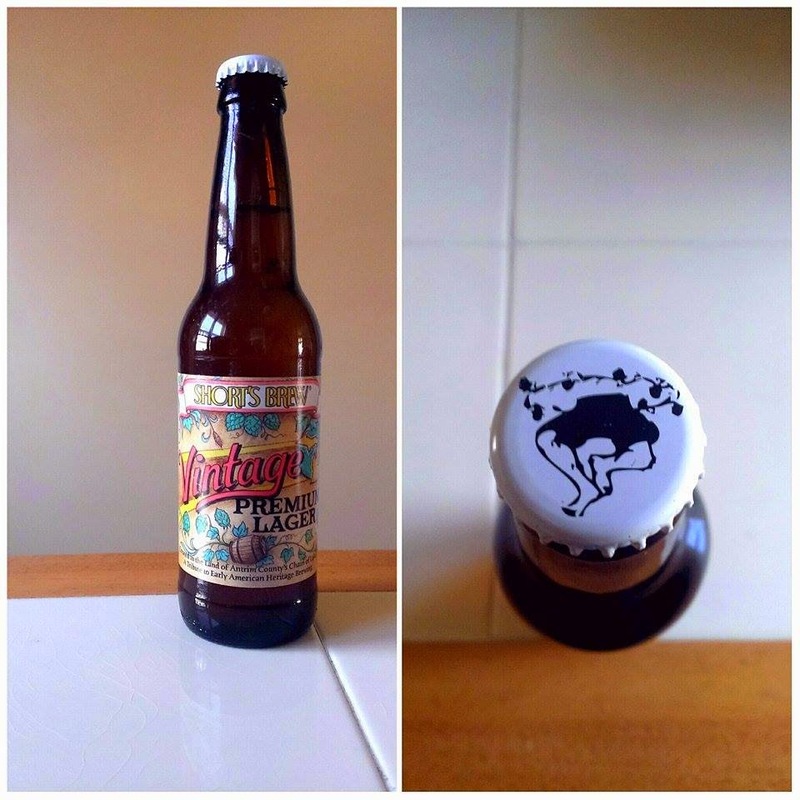 It's been roughly a week-and-a-half since I wrote about a lager. Unlike that one, Short's' offering doesn't appear to have special fruit-infused frills. All I can garner from the bottle's label are two things: it was made "...in the Land of Antrim County's Chain of Lakes" and that it's "...A Tribute to Early American Heritage Brewing." Nothing about blueberries or other fancy incentives to tempt one to imbibe. I'm guessing that Antrim County's chain of lakes is somewhere in or around Elk Rapids, Michigan, where this beer was brewed. The star on the bottle's depiction of the state leads me to believe that Elk Rapids can be found on the tip of ring finger in the mitten that is Michigan. The webpage for Short's' production facility validates my suspicions. Speaking of Short's Brewing Company's website, the place is a plethora of information about the brewery. I farted around on it for a few minutes and learned that not only does the company have a manifesto, it also became a registered business in 2002 but didn't start selling beer at its pub until 2004 (2003 was spent turning an old hardware store into said pub). The Brewery makes over 250 different styles of beer. So it's by sheer, lucky happenstance that I picked its Vintage Premium Lager to be a member of my four-pack. Its aroma isn't anything special. It smells like a pure lager. Both Purrl and I like it. She gave it nine sniffs and probably would have come back for more, had I presented her with an opportunity. 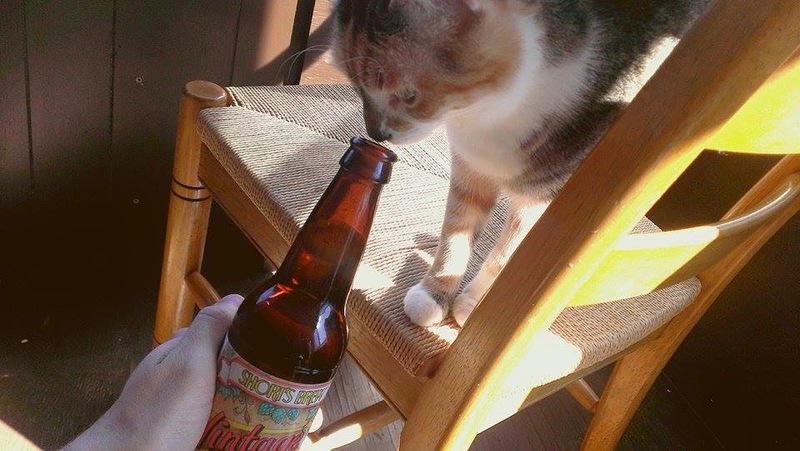 But, seeing how much she liked it, I immediately felt it necessary to absorb the brew's aromaticness. It's a simple elegance. That same elegant simplicity is present in the brew's flavor. The lager is crisp and refreshing (perfect for a warm, sunny Cincinnati day like today). Its straightforward with its presentation, but there's an undertone to the taste that I can't put my finger on. Whatever it is, though, it gives the lager the same effect that a slightly metallic taste gives to bottled water. Which is to say, it makes the beer more satisfying (if that makes sense to you. It does to me). The description of Vintage Premium Lager on Short's' website claims that the brew tastes like toasted white bread with an extra note of sweetness. I get that. But I only get that because I read it. Had I not been informed of the toast flavor thing I never would've picked up on it. The beer is really bubbly. Despite that fact, however, it goes down incredibly smoothly. And thanks to its low ABV (4.0%) you can take full advantage of its smooth drinkability. I really like Short's Brewing Company's Vintage Premium Lager. Unfortunately it's beer locator does not indicate that it's available anywhere near me. I guess that means it'll be a treat for when I visit Michigan family and friends. I give it an 8.5/10, so picking it up whenever I can will definitely be a priority.